Nieto and Sons specializes in the degassing or removal of organic gases from above-ground and underground storage tanks, reservoirs, or other containers or pipelines which generally house fluids such as gasoline and crude oil. We are a APCD permitted company that has been serving the professional storage facility industry since 1997. Our degassing methods expedite the removal or the conducting of tank maintenance in both a cost effective and timely manner. 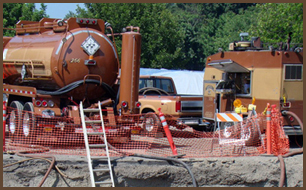 Nieto and Sons also specializes in the cleaning and removal of above-ground and underground storage tanks. To learn more about this particular aspect of our company services please click on the corresponding link below.